I know, I know, I need a life. 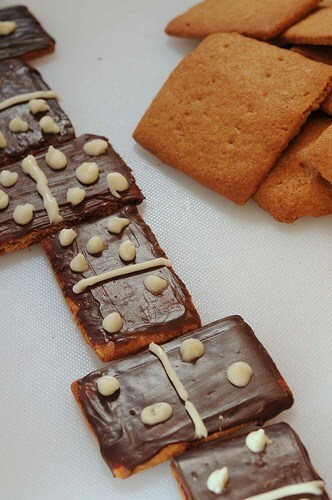 As if it isn’t bad enough to make your own graham crackers, then you have to go and decorate them? Hey! I’m on vacation and this is my hobby. It’s how I like to waste my time. But it sure is fun playing Martha and then taking pictures to remember the fun forever. 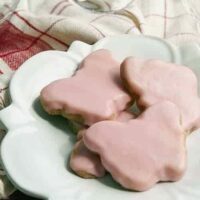 After making graham crackers yesterday, my husband and I started reminiscing, He talked about his Aunt Pearl. I thought of my Grandma Herd. Then, my sister mentioned Grandma again after she saw yesterday’s post. They all offered us chocolate-covered graham crackers when we visited their home. Even if these are a blast from the past, they are so good and so easy. It would be a great project for the kids on a cold, rainy day or a nice addition to your cookie jar. Place soft dough inside a gallon-size zippered plastic bag. Use a rolling pin to level out dough from corner to corner. Freeze dough until hard. Peel back plastic on one side. 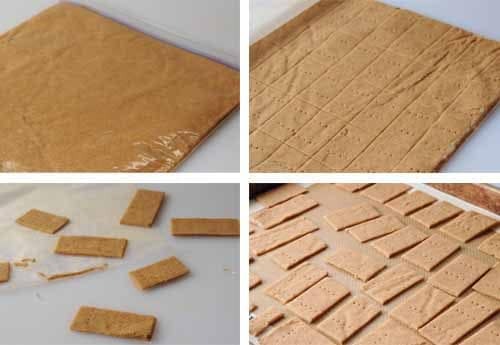 Cut dough into preferred cracker size and use a fork to perforate. Place on a lined (with a silicone mat or parchment paper) cookie sheet. First: Melt 1/2 cup semi-sweet chocolate chips in a small bowl in the microwave for 1 minute. Stir and return to microwave for however long it takes to melt the chocolate. Add a few drops of vegetable oil and stir. This will buy you time and spread-ability. Second: Spread thin layer on top of each graham cracker and allow to dry. Refrigeration will speed up the process. Third: Melt approximately 1/4 cup of white candy coating in small plastic snack bag in microwave oven for 1 minute. Massage sealed bag to be sure all chocolate is melted. Fourth: Snip a small corner of the bag and decorate cookies as desired. Note: I have used white chocolate chips for this in the past but found it difficult. The white coating or dipping chocolate works much better. Combine flours, cinnamon, baking soda and salt in a bowl and whisk well. 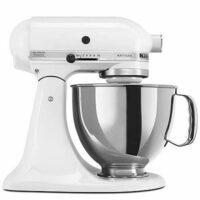 Use electric mixer to beat butter till softened. Add sugars. Mix well. Add honey, egg and vanilla extract and mix. Add dry ingredients to butter/sugar mixture in three parts, mixing only enough to combine ingredients after each part. Divide dough in half. 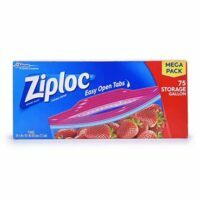 Place each half into a gallon-size zippered plastic and close the bag after removing any extra air. Leaving dough in bag, roll until dough fills bag and is uniform in width all the way to the corners. Place in freezer until stiff. This may be the hardest part of this recipe--finding a place to lay the bags flat in a stuffed freezer. Preheat oven to 350 degrees. Line cookie sheets with parchment paper or silicone baking mats. Using scissors, cut bag open so top layer of plastic can be pulled back to reveal dough. Using knife, pastry cutter or pizza cutter, cut crackers in desired size. Transfer to baking sheet. Poke with fork if desired. This step needs to be done quickly before dough warms and becomes too soft to handle. 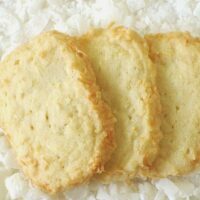 Bake for 13-14 minutes (time may vary according to size of your crackers) or until lightly brown around the edges. Let cool for a couple minutes before removing to rack to cool. 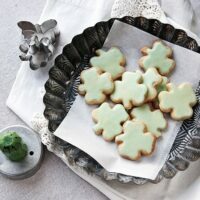 Posts Related to "Homemade Graham Crackers Part II (Chocolate Covered)"
Shamrock Shortbread Cookies are classic shortbread cookies cut into shamrock shapes and glazed with green icing. 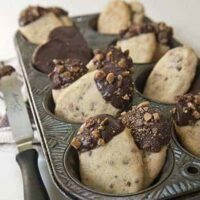 Use a Ziplock bag to roll out dough for easy clean-up. I know that this is a really old post, but I want to comment anyway. 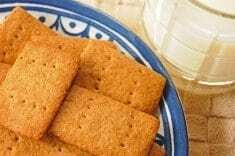 The chocolate grahams remind me of childhood too. My mom didn’t cover them, but used frosting, and made sandwich cookies. They are best made a bit ahead of time, so the frosting can dry out a bit. Eaten fresh, the frosting squishes out. That can be fun too, though. Peanut butter works fine, too. 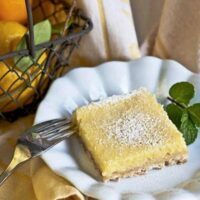 I have served my grandkids these when I want a quick, sweet treat. Whoa! This takes me down memory lane. My mom did exactly the same thing. We used to put them in the fridge so the frosting wouldn’t squish out. But like you said, “squishing frosting” was fun because then you could lick it off the edges. Thanks for reminding me of this. 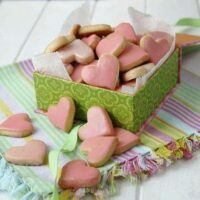 I don’t keep cookies in the house like my grandma used to so this trick would come in handy when the grandkids are keen to have something sweet to eat. That is my Mom’s favorite game! Too cute! Must be enjoying your time off. Brings back the 42 memories. You are just too clever and creative. 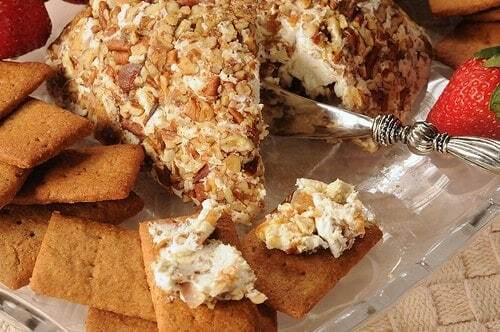 The graham crackers look so good, it makes mr want to try this. Happy New Year! Well these are just plain fun! I can tell you had fun making them, or should I say frosting them! That’s the important part of it all – I’ve been on vacation all this week too and loving every minute in the kitchen! Thanks for the tip of “spreadability” with the oil! 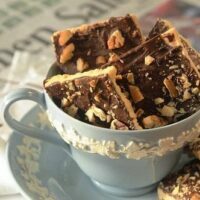 Chocolate is so finicky…. A very Happy New Year! You and me, we do the same thing–play around in the kitchen. It’s the best. 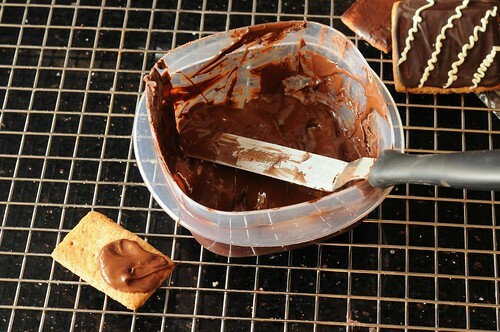 I made homemade graham crackers last month, regular ones, chocolate (nutella) ones, AND banana ones. They were all great! 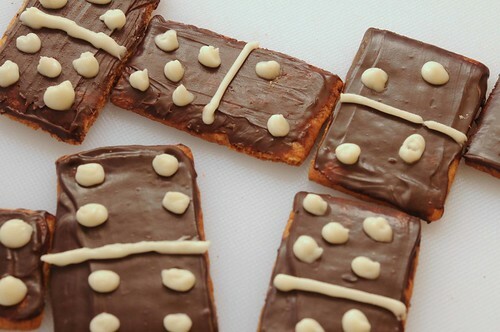 Yours look de-lish with the chocolate and Domino effect! Happy New Year in the kitchen! 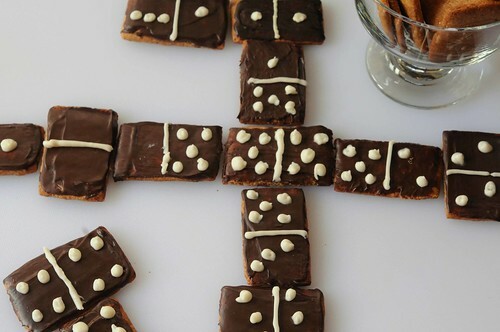 What a tasty and pretty way to play a game of Dominoes. Happy everything in 2010!